Showers To End This Morning with Partly Cloudy Skies today and Wednesday…..Improving and Warmer Weather Expected Thursday into the Weekend…….MJO shifting into Phase 3 May bring a return to cooler and possibly wet weather Week 2…..
« Memorial Holiday Weekend Breezy with near seasonal temps…Then stronger upper trof to descend rapidly toward the Sierra Monday Afternoon into Tuesday…. Nice little system freshens up the air and dampens the forests and wildflowers….. Skies were becoming partly cloudy this morning as the remaining deeper moisture moved off to the SE. Total precipitation was .21 hundreds for the system bringing the monthly total of .44 inches of water for the month of May, here at Mammothweather.com. A dusting of snow, possibly a few inches occurred at elevations above 10,000 feet. For the next few days we will be under the effects of an anti-cyclonically curved upper jet. As a 130knot portion comes inland along the Northern Ca/Oregon border Wednesday morning, it will be locally windy across the Eastern Sierra Wednesday morning as the front RT exit region buffets our area. The NW/SE axis is always a windy or breezy position for the upper jet, over Northern Ca. Our 5 day WX pattern is in transition, as the upper jet takes a hike to the north Thursday into Friday. Be ready for a warm beautiful weekend that will begin Friday with day time high in the low 70s! Yes……Just when the Dweebs were ready to hang this Winter up, another active MJO is expected to develop into Phase 2 then move through Phase 3. This puts more organized tropical convection well into the Eastern Indian Ocean then Maritime Continent. So where are the Dweebs going with his all? A few discussions back I touted the idea that winter was over and that the remaining last gasp was at hand. I am not so sure about that this morning. So although the Eastern Sierra will experience warmer and improving weather beginning Thursday, and that above normal temps will be the rule beginning Friday into the weekend. According to the European Centre for Medium Range Weather Forecasts Ensemble System (EMON), the MJO will be making an incursion into Phase 3 after next weekend. So what you say! 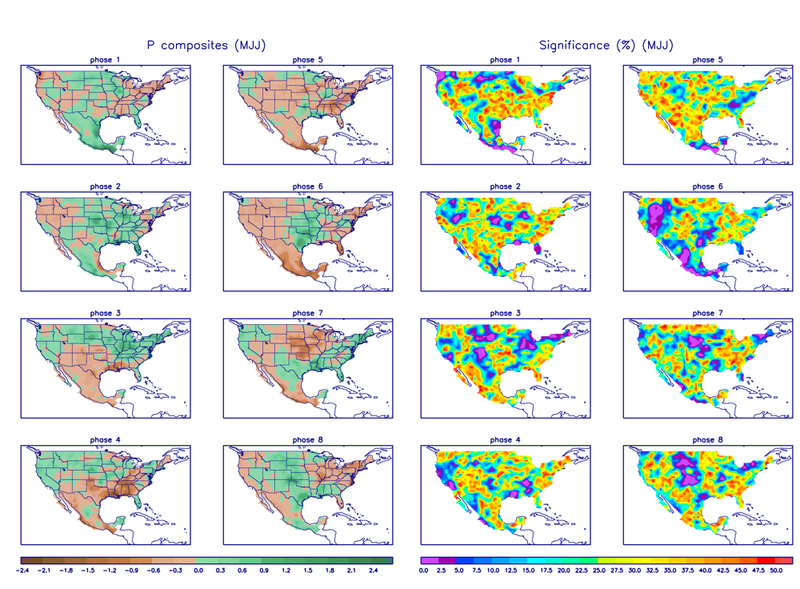 Now look at the composites for temperatures in June with respect to the Phase of the MJO. 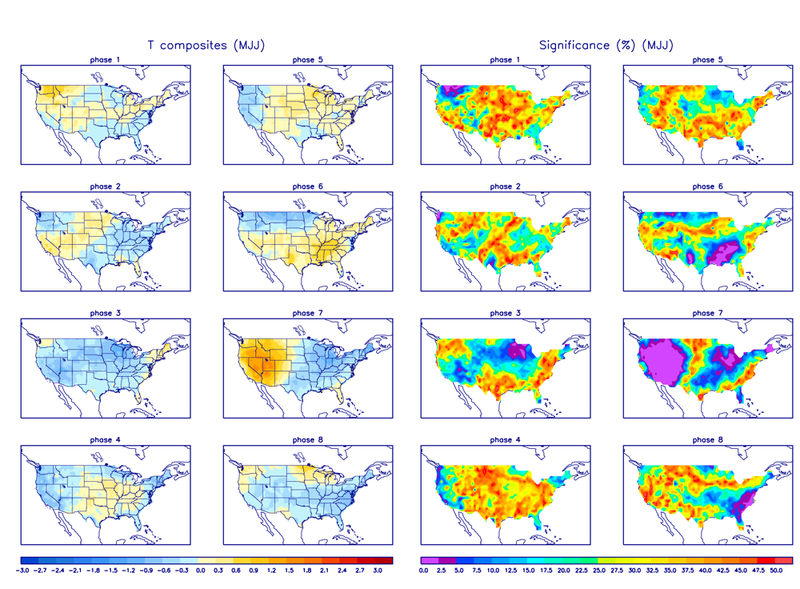 Now look the significance for the same time frame for Phase 3.
http://www.cpc.ncep.noaa.gov/products/precip/CWlink/MJO/Composites/Precipitation/MJJ/combined_image.png for precipitation. And more importantly the “Significance” is showing a nice bull’s-eye of red over us. That’s pretty high in our neck of the woods! So Summertime weather may have to wait a few more weeks to kick in after this weekend.